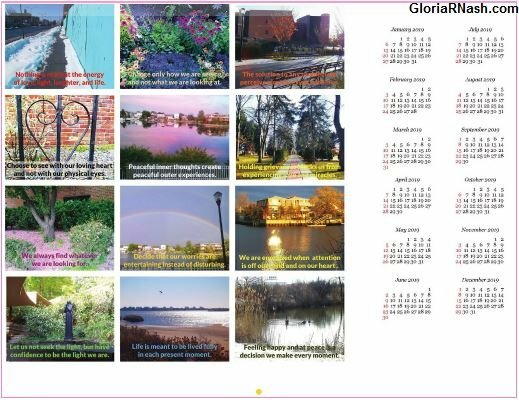 This 2018 wall calendar of inspirational monthly views was influenced by “A Course in Miracles,” a spiritual psychology text with 365 Daily Lessons. Featuring photographs by Gloria R Nash and quotes from “Nothing is Real but Love,” her forthcoming guide to living a spiritual life. Gorgeous American cityscapes in full color will most certainly engage our creative spirit live with great greater joy knowing we can attract more miracles in every situation. Printed on highest quality paper, these 12 images and ideas will keep even the most distracted person focused on divine vibrations each day of the year. Celebrate positive energy, wisdom, faith, and miracles. Each month depicts a spiritual quality to bring to our focus of attention on what really matters. As a result, the glorious colors shown in these 12 Wall Calendar images will energize everyone to live with more love, light, and laughter. Measuring 8.5” x 11”, inspirational 2018 Wall Calendar is only $10.95, with FREE Shipping within the 48 States. Ships in one business day, via First Class with Free Tracking! This makes a perfect gift for friends, family, teachers, mentors, but it is especially perfect for you! Please note that calendars are not refundable. All images are copyrighted to Gloria R Nash. No reproductions without permission. !!! F A S T & IMMEDIATE SHIPPING !! !